Buy condo - Prices start from 9.5 million Thai Baht. Rent condo- from from 50,000 Thai Baht per month. Available for short or long-term rentals or to purchase - great for investment or rent-to-buy with our finance options. Grand View Condominium is located in the peaceful area of Baan Amphur, 20 minutes from central Pattaya. Nearby there are some must see attractions such as Nong Nooch Tropical Botanical Garden, Pattaya Floating Market, as well as golf courses and good transport links to the south. The Baht bus route runs past the complex and costs only 20 Baht to Pattaya. The Condominium has beach front access to a lovely tranquil beach, perfect for relaxing days of sunbathing, swimming in the sea and watching beautiful sunsets. Baan Amphur is a small fishing village known for its seafood restaurants, which offer lovely fresh produce, with some restaurants being built over the sea giving a lovely tranquil atmosphere. There is also a picturesque fishing harbor and beautiful views over the sea and the distant islands. 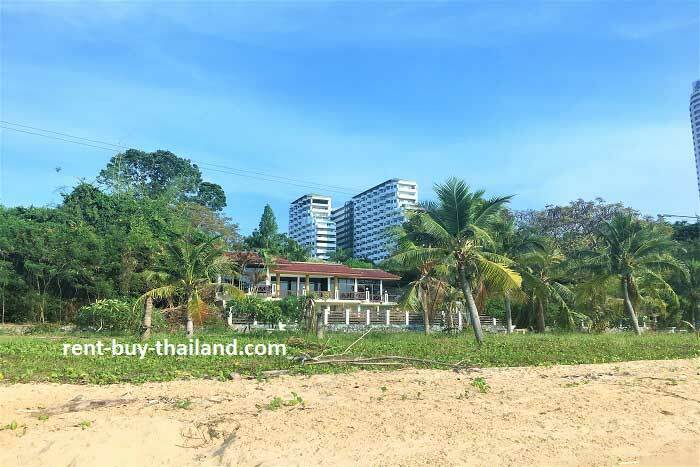 You will find a lovely wide sandy, palm tree lined beach here, which is very clean and much quieter than the beaches of Pattaya and Jomtien. Although very quiet during the week the beach is popular with locals on the weekends. There are beach vendors here who will bring food and drinks to your seat on the beach under the shade of an umbrella, allowing for a lovely beach dining experience. Baan Amphur Village is a quiet, peaceful and family friendly area. It is not far from Pattaya where you will find numerous shops, markets, temples, restaurants and bars. Pattaya offers a vibrant night life and a variety of tourist attractions to keep you entertained, along with 4 km of beach offering various water-sports and trips to the nearby scenic island of Koh Larn. Looking to buy apartment Pattaya, Jomtien - we have a large selection to choose from.